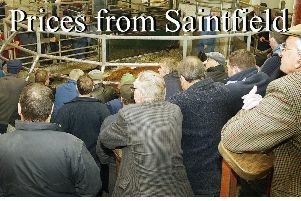 A super entry of 300 calves on Thursday 19th April met a flying trade for all types on offer. Bull calves: W Harkness, Cookstown, Simmental £405; B McAfee, Aghadowey, Belgian Blue £350, Aberdeen Angus £340; N Allen, Ballymena, Simmental £330, £280, £220; G and A Forsythe, Cloughmills, Hereford £315; J Reid, Kilraughts, Aberdeen Angus £300; D Connell, Claudy, Holstein £290, Limousin £260; K Scullion, Portglenone, Hereford £272; N G and C Smyth, Ballymena, Fleckvieh £260; I Smyth, Castlerock, Aberdeen Angus £248, £205; Irwins Drumcroone, Coleraine, Aberdeen Angus £240, Simmental £202; Ballymena farmer, Limousin £218; H McFerran, Ballywalter, Holstein £215 and M Robinson, Dungiven, Belgian Blue £210. Heifer calves: W Harkness, Cookstown, Hereford £305; B McAfee, Aghadowey, Aberdeen Angus £265; K Scullion, Portglenone, Hereford £265; G and A Forsythe, Cloughmills, Hereford £262; J Reid, Kilraughts, Aberdeen Angus £245; W Andrew, Ballyclare, Limousin £230; D McTague, Ballymoney, Limousin £225, £210; Ballymena farmer, Limousin £207; G E Bates, Moneymore, Belgian Blue £200 and Irwins Drumcroone, Coleraine, Aberdeen Angus £200. Friesian calves: Super trade met with more required to satisfy demand. Weanlings/suckler calves: 100 on offer with more required to satisfy demand. Being offered for sale at approximately 12.30pm weekly. Continental and Friesian lumps a super trade. Customers for cattle up to 18 months. A good entry of 300 on Monday 23th April met a sharp trade. Lambs to £120 plus to 519 per kg. Lambs: T Smyth, Kilrea, 21k, £109 (519); S Caldwell, Rasharkin, 23k, £117 (509); W McCallion, Portglenone, 20k, £101 (505); S J Smyth, Randalstown, 23k, £113.50 (494), 25k, £114 (456); N Parke, Cookstown, 22.5k, £108 (480) and Portglenone farmer, 21k, £98 (467). A good entry of dairy stock on Tuesday 24th April met a super trade to a top of £2,010 for a calved heifer. T McCracken, Limavady, calved heifer £2,010 and D McKeeman, Ballymoney, calved heifers to £1,670 and £1,600. A super entry of 350 stock on Wednesday 25th April at Kilrea continued to meet with a super trade. Steers to £1,365, heifers to £1,360 and fat cows to £1,265. Claudy farmer, 600k Limousin £1,265 (211); S and D Donnelly, Ballintoy, 450k Blonde d’Aquitaine £945 (210); M McNeill, Cushendun, 380k Limousin £780 (205); S Anderson, Ballymoney, 620k Limousin £1,150 (186), 450k, £745 (166), 370k, £580 (157), 490k, £760 (155), 590k Belgian Blue £810 (137); J Morrison, Dungiven, 540k Limousin £950 (176), 620k, £1,070 (173); Randalstown farmer, 570k Blonde d’Aquitaine £990 (174), 640k Saler £1,000 (156); Macosquin farmer, 680k Limousin £1,175 (173); J Tannahill, Macosquin, 620k Fleckvieh £1,050 (169); T Martin, Dunloy, 550k Limousin £895 (163); W I Cameron, Articlave, 760k Aberdeen Angus £1,195 (157); N Rosborough, Claudy, 630k Limousin £980 (156); A Andrews, Castlerock, 700k Aberdeen Angus £1,060 (151), 720k Limousin £985 (137); E McLoughlin, Limavady, 660k Holstein £980 (149); Workman Farms, Aghadowey, 780k Holstein £1,160 (149); G Campbell, Garvagh, 650k Limousin £950 (146); H J Walsh, Portglenone, 490k Limousin £675 (138); J Higgins, Ringsend, 510k Charolais £695 (136) and J A Nevin, Ringsend, 510k Friesian £695 (136). Claudy farmer, Limousin heifer with Limousin bull calf at foot to £1,860, Limousin heifers with Limousin heifer calves at foot to £1,760 and £1,500. Heifers: Castledawson farmer, 360k Charolais £870 (242), 360k, £865 (240), 360k, £845 (235), 365k, £820 (225), 360k, £760 (211), 290k, £600 (207); Toomebridge farmer, 360k Limousin £845 (235); M McNeill, Cushendun, 300k Charolais £700 (233); S McLoughlin, Limavady, 530k Charolais £1,225 (231), 490k, £1,125 (230), 370k, £780 (211), 510k, £1,065 (209); A Fenton, Rasharkin, 510k Charolais £1,150 (226), 500k, £1,100 (220), 490k, £1,080 (220), 480k Limousin £1,040 (217), 510k Charolais £1,075 (211); J McGrath, Dunloy, 275k Limousin £620 (226); S Hegarty, Claudy, 230k Charolais £520 (226), 250k, £555 (222); Bonnar Farms, Ballymena, 280k Charolais £630 (225), 300k, £665 (222), 295k, £620 (210), 315k, £660 (210), 310k, £640 (207); Randalstown farmer, 320k Limousin £720 (225), 360k, £745 (207), 360k, £725 (201), 350k, £690 (197); Kilrea farmer, 290k Charolais £650 (224); R C and J C Watson, Rasharkin, 430k Limousin £940 (219), 290k, £625 (216); J Doherty, Garvagh, 260k Charolais £223, 230k, £500 (217); D Semple, Dungiven, 315k Charolais £700 (222), 360k, £770 (214), 350k, £700 (200); W Brown, Magherfelt, 570k Charolais £1,220 (214); R Duncan, Magherafelt, 590k Aberdeen Angus £1,260 (214), 500k, £1,045 (209); I McAleese, Aghadowey, 640k Charolais £1,360 (213), 530k Limousin £1,080 (204), 620k Charolais £1,255 (202), 590k Charolais £1,150 (195); C Mooney, Rasharkin, 510k Aberdeen Angus £1,080 (212), 390k Limousin £775 (199), 395k, £780 (198); Ballymena farmer, 440k Charolais £930 (211), 530k, £1,110 (209), 420k, £860 (205); G Campbell, Garvagh, 450k Limousin £940 (209); D Clarke, Moneymore, 465k Aberdeen Angus £965 (208), 440k, £895 (203), 490k, £980 (200); R W Kane, Ballintoy, 380k Limousin £790 (208); J Armstrong, Upperlands, 540k Simmental £1,115 (207); J G Gordon, Kilrea, 460k Aberdeen Angus £950 (207), 350k Belgian Blue £690 (197); I Smyth, Bushmills, 470k Charolais £945 (201); D McKee, Randalstown farmer, 410k Aberdeen Angus £820 (200); W Doherty, Articlave, 570k, £1,125 (197) and H Savage. Magherafelt, 300k Charolais £590 (197). Steers: J McGrath, Dunloy, 240k Charolais £680 (283), 310k Limousin £710 (229); J Doherty, Garvagh, 220k Charolais £580 (264), 230k, £585 (254), 230k, £520 (226); Claudy farmer, 230k Belgian Blue £605 (263), 220k Charolais £570 (259), 270k Aberdeen Angus £580 (215), 280k Charolais £600 (214); D Semple, Dungiven, 350k Charolais £895 (256); L Selfridge, Maghera, 340k Limousin £865 (254), 350k, £870 (249), 500k, £1,160 (232), 290k, £670 (231), 520k, £1,115 (214), 390k, £780 (200), 360k, £710 (197), 380k, £745 (196); J V McAteer, Kilrea, 300k Limousin £745 (248), 390k Aberdeen Angus £880 (226), 355k Limousin £785 (221), 330k, £690 (209); D Semple, Dungiven, 430k Charolais £1,050 (244), 330k, £765 (232), 410k, £930 (227), 380k, £845 (222), 340k, £685 (202); J S Hamilton and Son, Kells, 340k Simmental £815 (240), 350k, £745 (213), 390k, £825 (212), 360k, £760 (211), 300k, £630 (210); Maghera farmer, 490k Limousin £1,120 (229); J McErlean, Kilrea, 390k Limousin £880 (226), 440k, £950 (216); M McNeill, Cushendun, 310k Charolais £700 (226), 280k, £625 (223), 290k, £640 (221), 330k, £710 (215); T Scott, Swatragh, 340k Limousin £760 (224), 370k, £770 (208), 450k, £900 (200), 430k, £855 (199), 450k, £890 (198); S Smyth, Randalstown, 380k Stabiliser £845 (222), 380k, £820 (216); R Duncan, Magherafelt, 570k Aberdeen Angus £1,250 (219), 610k, £1,325 (217); G Boyce, Garvagh, 540k Limousin £1,155 (214), 570k, £1,190 (209), 470k Belgian Blue £980 (209), 510k, £1,055 (207), 570k Limousin £1,150 (202); W Doherty, Articlave, 580k Lim £1240 (214); A Lagan, Portglenone, 480k AA £1,025 (214); S Henry, Macosquin, 550k Belgian Blue £1,155 (210); H Clarke, Upperlands, 570k Limousin £1,185 (208), 660k, £1,365 (207), 650k, £1,280 (197); G Neely, Limavady, 430k Hereford £890 (207); W and M Kennedy, Cullybackey, 440k Limousin £900 (205), 480k, £940 (196) and J Adams, Coleraine, 460k Simmental £935 (203).